Welcome to Android Central! A connection might have been jarred loose. If you're handy, you could see if there are any YouTube videos showing how to open up the back and check screen and power connections. Otherwise, bring it to a repair shop. There are different between a not turning on and turning on but no display. No display, your tablet will have some sound in the background when starting up or the back and menu will light up when press the HOME button. In this case, the LCD cable probably get loose as it's a plugin to connector on mainboard. You just need to pop it up and plug it in again. In this video, the LCD cable ( orange ) is on the left side of the battery. Don't use the metal tool as this guy as most inexperienced users will damage the LCD frame and the tablet should be OFF when doing disassembly. If you have a HDMI adapter, connect your tablet to a TV via HDMI cable, it will show the display if your tablet is ON ( have sound but no display ). Listen to Beut -- he knows what he's doing! This is a common problem of SM-T580, the connector very weaky secures the lcd cable. Just reseat the lcd cable and secure it with tape to prevent loose connection. You don't touch any screw, just remove the back cover, then reseat the LCD cable. 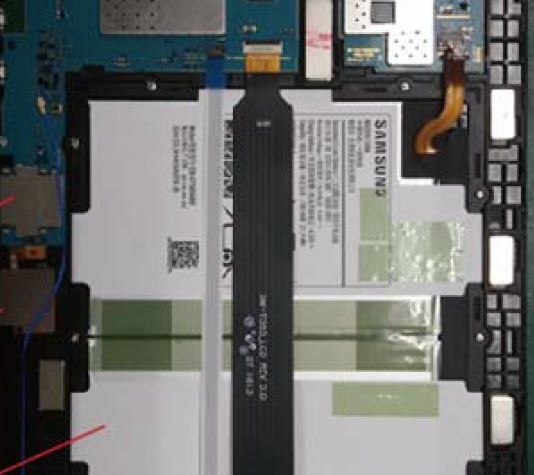 Actually Samsung tablets are very simple with few screws. The LCD cable is the black one, located along the center of the battery.To avoid a short, battery cable should be disconnected first. You just need to lift up the locking tab at the top of LCD connector, be careful as it's very fragile, then push the cable all the way in , press down the locking tab and secure it with tape. A simple fix for many Samsung tablets which suddenly have a black screen but having sounds in the back ground. Without tapes, this LCD cable can get loose easily, even without a drop.